The 27th Florence International Antiques Fair (aka Florence Biennale) will be hosted this year at the enchanting Palazzo Corsini from October 1st– 9th with a layout masterminded by the Maestro Pier Luigi Pizzi. The Biennale, first started by Mario and Giuseppe Bellini in 1959, is the oldest continuous art and antiques fair in Europe and has become the most important Italian art exhibition in the world. The home to the bi-yearly Florence Biennale since 1997, the Palazzo Corsini in its subdued Baroque style with an 18th-century flair is truly a unique and greatly admired building in Florence and a sight to see in itself. The residence, which was completed only in 1737, is also the proud home of Florence’s most important and historically significant private gallery, boasting a collection, begun in 1765 by Don Lorenzo Corsini, nephew of Pope Clement XII. The works of art displayed by antiquarians from all over the world–74 Italian and 14 foreign—are the undisputed stars of the show. The vast variety of the over 3,000 pieces presented at the fair range from paintings to plates and antique books to sculptures. All the works exhibited at the Biennale will be monitored and authenticated by the Scientific Committee. 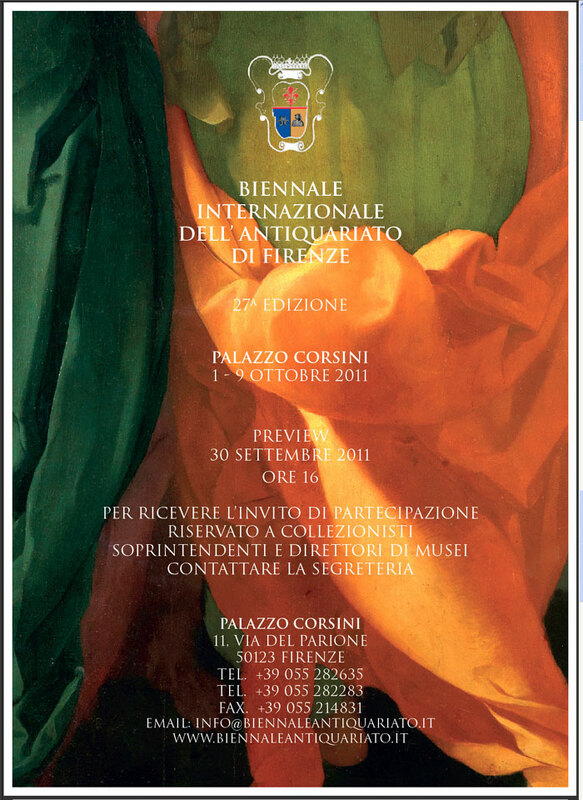 On September 28th, two Committees, the first appointed by the Florence Exports Office, and the second sent by the Ministry for the Cultural Heritage, will examine the works for which the antiquarians request a free circulation certificate, a document which allows Italian works of art to circulate abroad. The Biennale continues to support Corri la Vita, an association, devoted to the study and prevention of breast cancer presided over by the Marchioness Bona Frescobaldi. On October 1st a charity evening will be held and during the dinner Christie’s will auction works of art donated by exhibitors at the Biennale. The proceeds of the auction will be devolved entirely in favour of the Association. On October 5th prizes will be awarded to the best painting and sculpture at the Fair. The prizes, amounting to 10,000 Euro each, will be destined to the restoration of a work of art from the public cultural heritage. On October 6th the “Lorenzo d’oro” prize will be awarded to Piero Angela, for his long and successful career as a director of documentaries. • The Mostra Internazionale dell’Antiquariato was launched in 1959 in the prestigious premises of Palazzo Strozzi. The Fair was the brainchild of Luigi Bellini Sr., designed to attract to Florence the very best in the international antiques world, and it made its name by offering the choicest selection in the collecting and antiques sector. The overwhelming success of the first Fair, and of those which followed, marked the start of a market season increasingly oriented towards the Antiques Fairs. The originality of the idea, accompanied by an astute selection of the antiquarians, transformed the Fair into a cultural and fashionable event that could not be missed, to the extent that the Florentine Fair was visited both by the members of the international jet set and by a crowd avid for curiosities, knowledge and marvels. The international triumph was triggered by the fact that it was held in Florence and was also accompanied for the entire duration by a series of highly attractive cultural and society events. Problems in the utilisation of Palazzo Strozzi, where adaptation work was being carried out, meant that in 1977 the antiquarians had to move to Palazzo Giuntini (now the Grand Hotel), after which they returned to the original site up to 1993. In 1987, Guido Bartolozzi took over from the Bellini brothers as the General Secretary. When Palazzo Strozzi became definitively unavailable in 1995 the Fair had to be moved to the Palazzo degli Affari, a fine building designed by Spadolini, but entirely unsuitable for an antiquarian fair of the level of the Florentine Biennale. For the following editions of the Fair, the choice fell on Palazzo Corsini sull’Arno, the current premises of the event, where it has been held since 1997. • In 2001 the Management Committee appointed Giovanni Pratesi, Chairman of the Italian Antiquarians Association, as General Secretary of the Florentine Biennale. This appointment represented a crucial turning-point for the Fair and it was in fact in 2001, with an absolutely innovative design and the inclusion of numerous novelties in the general programme, that the Biennale set off on the path that has led to its being considered today as one of the three most important antiques events in the world. • To place the Biennale at the level of the most prestigious international Fairs it was decided to promote strict controls on the works displayed, modify the image of the Fair by entrusting the orchestration to the Maestro Pier Luigi Pizzi, who performed an authentic masterpiece of restyling, introducing a new pavilion in the entrance courtyard of the Palazzo, boost promotion by setting up specialised Press Offices in the major cities of the world (Wiesbaden, London, Paris, New York); extend to the Italian exhibitors the same rights as their foreign counterparts, offering them advance examination of the works on display so as to provide them with export licences before the start of the Fair. Maria Maddalena Machiavelli, wife of Marchese Filippo Corsini, purchased the Palace from the Grand Duke Ferdinando II in 1649. Her son, Bartolomeo, began remodelling and redecorating the Palace in 1650. Initially the work was done by Alfonso Parigi the Younger, and then by Ferdinando Tacca, who continued with the project until 1671. Actual construction work on the Pa­lace as it stands today was commissioned by Filippo Corsini junior, in 1685, after the death of his father Bartolomeo. Construction was directed by Antonio Ferri, a versatile exponent of the late Baroque Florentine cul­ture. He was a set designer and engineer, who built machines and fortifi­cations and than poured his extraordinary elegance and creative skill into Palazzo Corsini, making it one of Florence most unusually luxurious pala­ces. The decorations, executed between 1692 and 1700, are among the finest examples of Florentine painting. Among the artists the Corsini family com­missioned to decorate the located, we must mention the outstanding maters Anton Domenico Gabbiani, Alessandro Gherardini and Pier Dandini. Palazzo Corsini, located on the banks of the Arno river, is in the heart of Florence, just a short walk from the Ponte Vecchio and the Duomo and near the smart Via Tornabuoni. When the Salon in the Palazzo Corsini was inaugurated in the late seven­teenth century, Antonio Ferri’s designs (1694‑1696) must have aroused wide­spread amazement. Entering the room from the grand staircase, which forces a corner view, is an enormous source of wonder. The visitor sees an extra­ordinary room flooded with light reflected from the walls with their co­lumns, bases and rippling cornice. The ceiling in the Salon is decorated with a glorification of the Corsini family, and it supports two gigantic painted wooden chandeliers that were carved by Antonio Francesco Gonelli between 1698 and 1700. The doors of the Salon open onto the adjacent deco­rated rooms. Size and prestigious location make this splendid salon one of the most sought after reception rooms in the heart of Florence. The impressive main staircase leads to the Aurora Gallery which is part of the main building: its large, arched windows look onto the courtyard and offer a splendid view of hills on the opposite side of the Arno river. This luminous and completely frescoed gallery was decorated by Bartolomeo Ne­ri and Alessandro Rosi, and with the other luxurious rooms of Palazzo Cor­sini, will house, from the 30th September to the 9th October, the 24th edition of the Inter­national Antique Fair. The Ballroom, that overlooks an internal courtyard, is reached via the mid­dle door (on the left) of the Salon. The large crystal chandelier and the gilded eighteenth century wall sconces complete the decorations. The fresco, painted by Alessandro Gherardini between 1695 and 1696 is set in a plasterwork frame enhanced with flowers and two scrolls. In the mid­dle of the composition in Aurora’s chariot drawn by Pegasus. The goddess of dawn, sister of Helios, the sun god, is surrounded by three maidens, the Hours, one of whom is holding a floral crown, while a Putto holding a torch, symbol of the goddess, precedes the chariot. On one edge of the fre­sco, Gherardini painted the Kingdom of Flora, with Zephyr, the young god with butterfly wings and some nymphs accompanying the goddess. On the oppo­site side is the Triumph of Galatea: the sea nymph is on a shell drawn by dolphins, and Polyphemus with his heard is in front of her, playing a love song on his pipe. The care the artist dedicated to the fresco is the fur­ther enhanced by the decorative elements he added: four vases in the cor­ners of the arch; those near the Kingdom of Flora are decorated with gar­lands of flowers, the other two with sea creature and fish. It can be easily said that this fresco is the finest decorative work in the entire Palace. During the Antiques Fair, the padded and lined with precious silk seats will be removed to protect their integrity. 7/12/11 –Round Top, TX – The writer F. Scott Fitzgerald once quipped that “there are no second acts” in America, but the Marburger Farm Antique Show in Round Top, Texas knows better. When the blockbuster show opens this September 27- October 1 for its 15th fall edition, the keywords are: re-purposing, resilience and continuous renewal. Many of the nearly 400 exhibitors from 38 states and nations will arrive at this re-invented cow pasture with second acts in full bloom, plus plenty of antiques ready to start new acts in new homes. What will Harper bring this fall? “I save the one-of-a kind pieces for Marburger,” she reports. This will include French architectural fragments from the exterior or interior of old buildings. “I’ll have three 18th c. architectural fragments long enough to go over doors or to be re-invented as a console base, in original blue paint, bluer than the sky, close to Robin Egg’s blue, but deeper.” Also in tow will be an 18th c. carved wood wall bracket, long and wide, with the most beautiful two angels faces that I’ve ever seen. You just want to gaze at it. It’s spellbinding.” Sounds like the chemist found her passion. Many dealers at Marburger Farm were educators and lovers of history, such as retired teacher Linda Wilder of A Wilder Place in Time. She can teach you about English ironstone china coming over as ballast in ships and being packed deep in covered wagons moving west. Or, after viewing Marburger Farm’s herd of Longhorns, you can learn more about cattle from Darvin King of Georgia’s Antiques from Abilene, Texas. When not loading step-back cupboards, King loads his cattle for top Cutting Horse events. The dealer next to him is upstate New York cowboy Patrick Kenny of South Porch Antiques and chief beef cattle judge for the New York State Fair. Step just across the aisle and retired pastor Jan Orr-Harter won’t have any cows, but she will offer a 1970s Milo Baughman cocktail table in burled wood and stainless steel. For the second year, a portion of the fall show ticket sales will benefit the Houston Affiliate of Susan G. Komen for the Cure. “No one knows more about rebuilding lives than the Susan G. Komen organization,” says Ashley Ferguson. “We are thrilled to lend our support and welcome them to the show.” Look for the Race for the Cure sign-up tent at the show. So first act, second or third, get yourself to Marburger Farm. Take that, F. Scott Fitzgerald! DENVER, Pa. – A top-tier private collection of gold, platinum and precious-gem jewelry amassed over several decades will be featured in a single-session, no-reserve specialty auction at Morphy’s gallery on Feb. 26, 2011. The collection – whose consignors previously owned fine jewelry stores in Florida – consists primarily of superior-quality estate jewelry selected “with a sophisticated eye over a number of years,” said Dr. John Morphy, director of Acquisitions & Appraisals for Morphy’s. “This is not retail stock; this was the consignors’ own collection, which they kept in a safe. Approximately half of it is vintage, and there are some truly spectacular pieces.” Around 80% of the collection is gold, 5% platinum and 5% sterling, Morphy said. 14K white gold Art Deco diamond ring with 3.04-carat center diamond in champagne or pale yellow color, and 1.02 carats of surrounding diamonds. Estimate $15,000-$25,000. Morphy Auctions image. Literally hundreds of diamond rings and bracelets will be offered, with many of the rings featuring large solitaires of outstanding clarity and quality. “I would say anyone who is thinking about marriage would be wise to view this collection, which includes around 30 engagement rings. They’ll be able to choose from what is essentially a jeweler’s private reserve, at prices likely to be far more competitive than those at a jewelry store,” Morphy said. One of the top rings in the sale is a 14K white gold Art Deco design with a 3.04-carat center diamond surrounded by an additional array of diamonds weighing 1.02 carats. Because the main diamond is an unusual champagne or pale yellow color, the attendant diamonds make it “pop,” Morphy said. 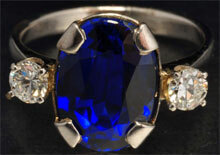 “It has huge eye appeal.” The ring is accompanied by its original jeweler’s papers and is estimated at $15,000-$25,000. 14K white gold ring with 4.37-carat deep blue oval sapphire and diamonds weighing 0.36 carats. Estimate $4,000-$8,000. Morphy Auctions image. Sapphires and diamonds have always been an especially compatible jewelry duo. The collection includes a 14K white gold ring boasting a 4.37-carat deep-blue oval sapphire with 0.36 carats of diamonds, estimate $4,000-$8,000; and an elegant 14K white gold link bracelet channel-set with 14.62 carats of sapphires and 5.28 carats of diamonds, estimate $8,000-$15,000. The names Tiffany & Co., and David Yurman add quiet prestige to the sale roster, both in gold and silver interpretations. A Tiffany 14K gold bracelet of wide, alternating fluted and smooth links is dated 1946 and estimated at $2,000-$3,000. Rolex stainless steel and 18K gold gentleman’s wristwatch, mechanical, Model No. 116233, with original box and papers. Estimate $5,000-$8,000. Morphy Auctions image. The premier timepiece brand Rolex will be available both to men and women in the assortment of six wristwatches to be auctioned. “Some of the Rolexes are vintage, possibly from the 1960s or ’70s,” said Morphy. “We are in the process of obtaining additional information about them from Rolex.” An example from the grouping is a gentleman’s stainless steel and 18K gold mechanical Model No. 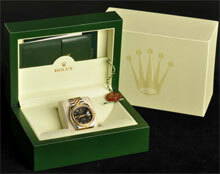 116233 with original Rolex box and paperwork. Estimate: $5,000-$8,000. Ten exceptional pieces from an additional consignor will be included in the sale, as well. The consignment includes an exquisite double-strand Victorian 14K gold “slide” bracelet with approximately 20 hand-crafted and jeweled components, some incorporating movable characters, e.g., snake, little girl, etc. Also, the mini-collection includes a 14K gold mesh purse with original gold strap and double-sapphire clasp, total gold weight: 59.9 dwt (pennyweight). 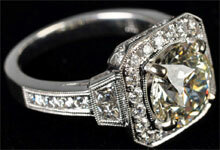 Both items date to around the turn of the 20th century and carry individual estimates of $2,000-$3,000. 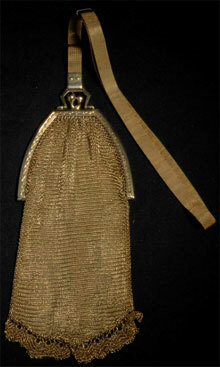 Turn of the 20th century 14K gold mesh purse with original gold strap and double-sapphire clasp, total gold weight: 59.9 dwt. Estimate $2,000-$3,000. Morphy Auctions image. Morphy Auctions CEO Dan Morphy described the jewelry to be auctioned as “a highly select collection that we’re very proud to have been chosen to present at auction.” All items will be sold to the highest bidder, regardless of price. All forms of bidding will be available for the Feb. 26 Fine Jewelry auction, including live in the gallery, absentee, by phone, or live via the Internet as the sale is taking place through Morphy Live or LiveAuctioneers.com. 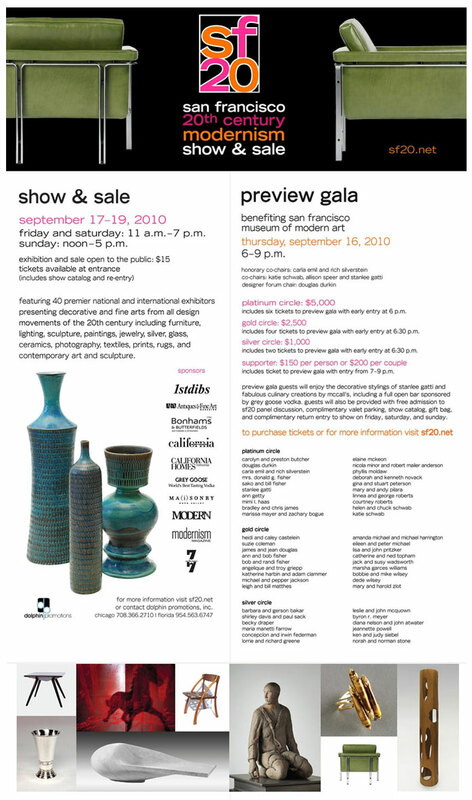 The entire auction inventory is presently available to preview at Morphy’s gallery. For additional information, call 717-335-3435 or e-mail dan@morphyauctions.com. Visit Morphy’s online at www.morphyauctions.com. 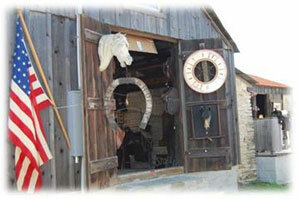 The Eleventh Annual Sewickley Antiques Show will be held on October 15th, 16th, and 17th, 2010 at the Edgeworth Club in Sewickley, Pennsylvania. 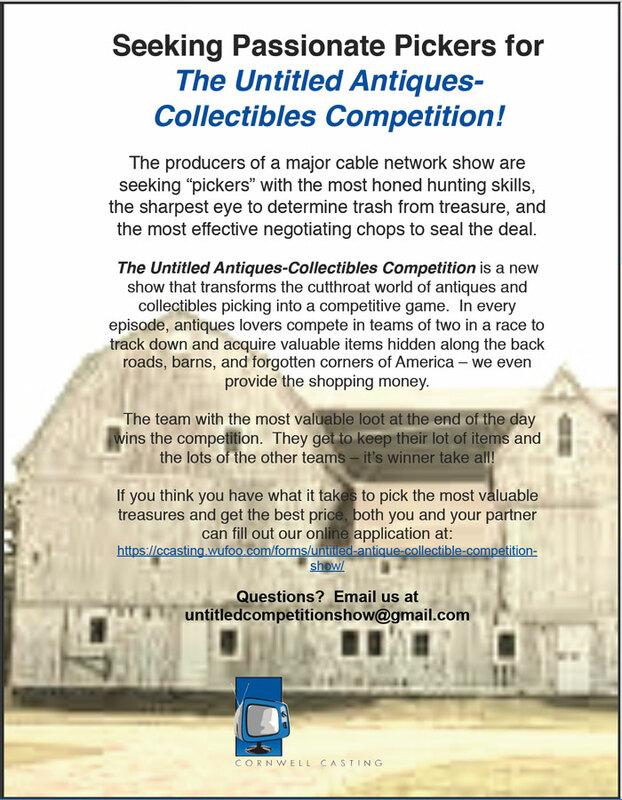 This show is regarded as one of the premier antique shows in Southwestern PA with twenty-seven exhibitors from eight states. 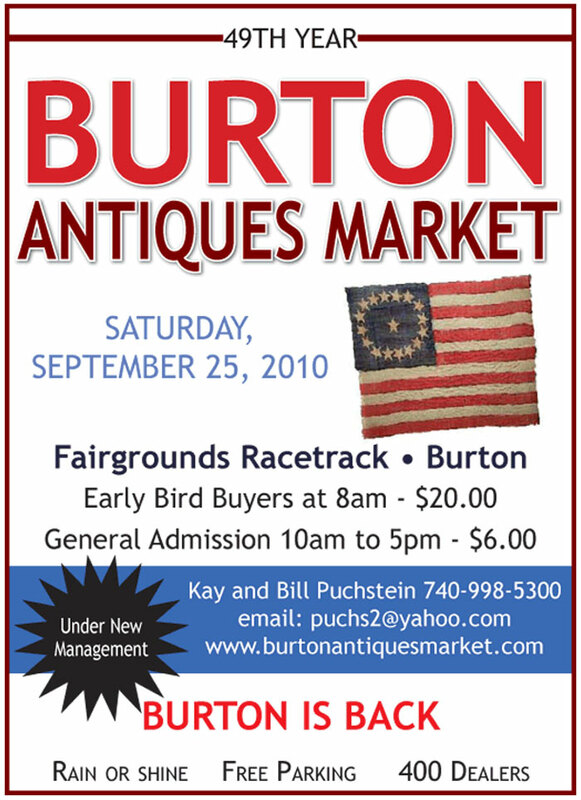 Kicking off the Antique Show is the Preview Party held on Friday evening, October 15th. The Preview Party runs from 6:30pm to 9pm with an after party following from 9pm to 11pm. The cost for this exclusive event that includes a weekend show pass, entertainment, a drink voucher, and hours d’oeuvres is $65.00 per person. The Show will run from Saturday October 16th, 10:00am to 5:00 pm., and Sunday October 17th, 11:00am to 4:00pm EST. The cost for the show pass is $10.00, valid all weekend. Proceeds benefit Child Health Association of Sewickley. For more information, send us an email or call Jack Squires at 724-992-1290. Click here for directions to the Edgeworth Club in Sewickley.